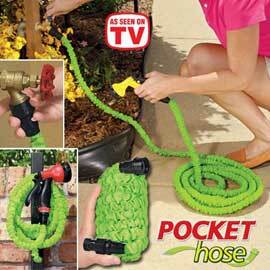 Fits in a pocket but grows to a full size hose! The Pocket Hose™ is the portable, compact hose that expands to a full size hose, but weighs less than a pound! It’s gentle enough to water your garden and strong enough to hose down your patio. Turn the water off, and the Pocket Hose shrinks back to its original size. It’s the perfect replacement to those bulky hoses that tangle and kink. Pocket Hose™ is also available in 50, 75 and 100 foot lengths at an additional cost for each longer length. Best of all, shipping and handling is just $7.99 no matter what length you select!